Our small size allows us to focus on those important little details and provide personal service to ensure that your stay is both a relaxing and memorable experience. 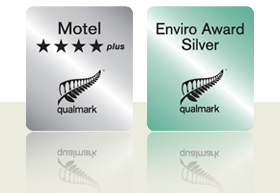 All our spacious rooms are air-conditioned (to provide some relief from Hawke's Bay's high summer temperatures and warmth in winter), and furnished to a high standard of quality which is reflected in our "4 Star plus" independently assessed Qualmark grading. Stay connected - making it easy for you to stay connected with family and work colleagues is essential when you are travelling, which is why we provide FREE unlimited wireless (Fibre) internet. Our quiet residential location (there are no crashing waves, barking seals, trucks or trains thundering through the night to keep you awake) ensures that you arise fully refreshed to take on the new days challenges and fully enjoy the great Napier and Hawke's Bay lifestyles and glorious weather. Centrally located in Taradale midway between Napier and Hastings city centres – ensures that you are close to all of Hawke's Bay's diverse range of activities and attractions. If you are looking for more than a standard motel, but not the excessive expense of a hotel then you are in the right place. Our accommodation makes the ideal base for visitors to Hawke's Bay. There are so many fun things for the kids to do in Napier during the October school holidays! January 2016 - Wots on in Napier? November 2015 - Wots on in Napier? October 2015 - Wots on in Napier?